Losing weight is not easy so when an important event is on the horizon many people feel pressured to lose those extra pounds as quickly as possible. Not to mention for those who have more than a few pounds to lose, finding ways to boost weight loss results is always a bonus which is why many people are turning to lipotropic injections . While these types of injections aren’t the latest weight loss breakthrough, they are gaining in popuarity among weight watchers of late. Why? Because they are designed to help your body eliminate fat more easily. In other words, they speed up your body’s metabolism when it comes to how fat is processed. They decrease the amount of fat deposited in your body and help your body remove fat more efficiently. What are lipotropic injections? What are the ingredients in lipotropic injections? Lipotropic injections are shots that contain a high dose of essential nutrients. Lipotropic injections contain vitamin B12 and MIC—a combination of methionine, inositol, and choline. They help you to maintain your energy level while on your low-calorie weight loss plan and support healthy fat burning. Plus, the combination of these nutrients help promote, encourage and support the removal of fat from your body. Without these nutrients, bile and fat can build up in your liver causing an array of health problems as well as causing your metabolism to slow, and in severe cases block fat metabolism completely. Most clients find that the injections also help with mental fogginess and improved mood. Vitamin B12 is more effective as an injected than in pill form, so you get the maximum benefit of this nutrient. Do lipotropic shots really help with weight loss? We get that question a lot and to be honest, yes these injections are a great way to boost your weight loss results. However, keep in mind that these are not an overnight magic pill that are going to help you shed 20 pounds in a weight. It’s important to still maintain realistic weekly weight loss goals. To get the best results you need to pair these shots with a healthy diet and exercise. When feelings of sluggishness are replaced with the abundant energy of an increased fat metabolism you can expect more impact from each visit to the gym. Plus, lipotropic injections help preserve lean muscle mass which further enhances your metabolism so you continue burning calories for hours after your workout. Are there other additional benefits to lipotropic shots besides weight loss? Before lipotropic shots, you feel sluggish and aren’t having a lot of success losing weight. Lipotropic injections give your body a jump start on losing weight and you get a noticeable boost in energy. If your body is missing essential nutrients that support the metabolic process even a healthy diet and exercise routine may not be enough to start losing weight. Lipotropic injections help jump start weight loss by providing your body with powerful such as B12, methionine, inositol and choline. 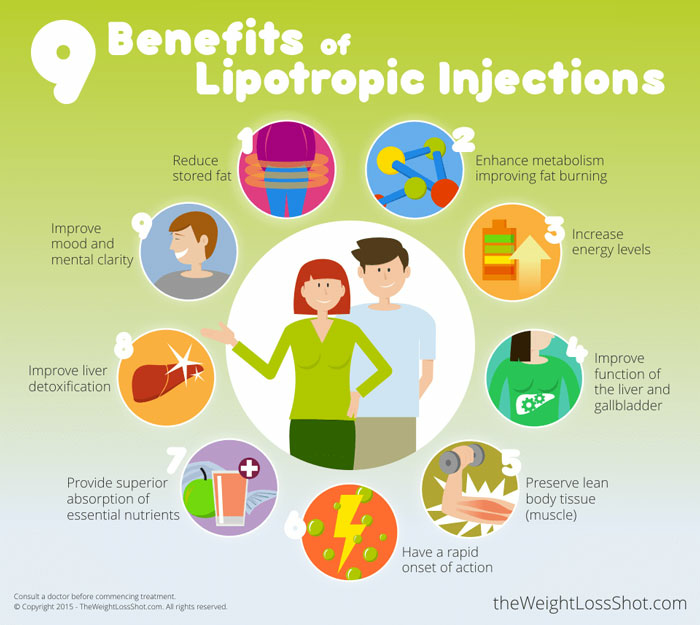 Check out the infographic below for additional benefits of lipotropic shots. While results may vary by individual, many of our patients in Orlando have shown that lipotropic injections are an effective weight loss aid and magnify the results obtainable through our weight loss program and exercise. If you have additional questions about lipotropic shots , give us a call today at 407.644.7546. We’re happy to answer any additional questions you may have. CHECK OUT OUR LIPOTROPIC SHOT PACKAGES ON GROUPON!